Garden Lodge at 1 Logan Place in Kensington, London W8 is a detached house that was built from 1908-09 for the painter Cecil Rae and his wife, the sculptor Constance Halford. The house has had several notable inhabitants since Rae including Peter Wilson, the chairman of Sotheby's auction house and was the last residence of the singer and songwriter Freddie Mercury from 1986 until his death at the house in 1991. The house was designed by the architect Ernest William Marshall and built in the Neo-Georgian style. It is two-storeys high with 8 bedrooms, and a pedimented studio wing with a large bay window is a notable feature. The builders were M. Calnan and Son of Commercial Road. It is set in an acre of landscaped grounds. An 8 ft high wall surrounds the garden with a dark glass door set into it that provides an entrance. The wall has been adorned with graffiti and messages from fans of Mercury since his death. Rae occupied the house from its completion until his death in 1935, Halford survived him and lived there until her death in 1938. The British intelligence operative Tomás Harris and his wife Hilda moved to the house during the Second World War and hosted many MI5 and SIS employees at the property. 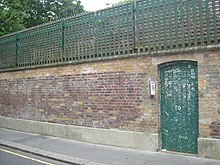 Freddie Mercury bought the house for £500,000 in cash from a member of the Hoare family in the mid 1980s. Bridget Cherry, writing in the 1991 London: North West edition of the Pevsner Architectural Guides described the house as "well hidden". ^ a b c "Survey of London: Volume 42, Kensington Square To Earl's Court: The Edwardes estate: Pembroke Square, Pembroke Gardens and Pembroke Road area". Victoria County History. 1986. Retrieved 26 October 2018. ^ a b c Lesley-Ann Jones (3 July 2012). Mercury: An Intimate Biography of Freddie Mercury. Simon and Schuster. p. 188. ISBN 978-1-4516-6397-6. ^ Juan Pujol García; Nigel West (11 August 2011). Operation Garbo: The Personal Story of the Most Successful Spy of World War II. Biteback Publishing. p. 76. ISBN 978-1-84954-625-6. ^ Bridget Cherry; Nikolaus Pevsner (March 1991). London 3: North West. Yale University Press. p. 519. ISBN 978-0-300-09652-1.